Full size, high-quality versions of the above images are available for limited editorial use by media representatives. If your organization would like to feature any of the above images, please contact the Public Affairs Department or call (561) 655-2833 ext. 13. Media representatives wishing to visit the Flagler Museum on official business should contact the Public Affairs Department at least 24 hours prior to any visit to make an appointment. Flash photography, tripods, or any kind of camera support equipment is prohibited. Formal or informal photography for personal projects or to mark personal occasions is not permitted. Photography for publication is not allowed without a permit from the Museum's Public Affairs Department. Please contact the Public Affairs Department to make an appointment, or to request a Film/Photography Permit Application, by e-mail at Public Affairs Department or call (561) 655-2833 ext. 13. On May 11, Discover The Palm Beaches (DTPB), the tourism marketing organization for Palm Beach County, presented their second annual Partner of the Year Award to the Flagler Museum. The Flagler Museum's Café des Beaux-Arts will open specially for Mother's Day on Saturday, May 12 from 11:30 am to 2:30 pm, and on Sunday, May 13 from 12:00 to 3:00 p.m. The Flagler Museum presents Bluegrass in the Pavilion April 7 at 3:00 p.m. Tickets are $35. The Flagler Museum will host it's annual Easter Egg Hunt Saturday, March 31, 2018. Masterfully Human: The Art of Gaugengigl, surveys the work of Boston painter and etcher Ignaz Marcel Gaugengigl (1855-1932), the first museum exhibition devoted to this Gilded Age artist. The Flagler Museum's Whitehall Lecture Series, Heroes of the Homefront: World War I and the Faces of Wartime America will be held each Sunday afternoon February 7th through March 6th. The Flagler Museum invites couples to celebrate Valentine's at Whitehall on Wednesday, February 14, 11:30 am - 3:30 pm. The Flagler Museum continues to provide the community with unique experiences and learning opportunities during the 2017 – 2018 Season. Please include the following events and dates on your calendars. The Flagler Museum's Café des Beaux-Arts will open specially for Mother's Day on Saturday, May 7th from 11:30 a.m. to 2:30 p.m., and on Sunday, May 8th from 12:00 p.m. to 3:00 p.m. The Flagler Museum presents Bluegrass in the Pavilion April 9th at 3:00 p.m. Tickets are $35. The Flagler Museum will host it's annual Easter Egg Hunt Saturday, March 26, 2016. The Flagler Museum will host its annual Mad Hatter's Tea Party on Saturday, March 12, at 10:00 a.m. The Flagler Museum Music Series presents the Meccore String Quartet March 8, 2016, at 7:30 p.m. Tickets are $70. The Flagler Museum's 31st annual Whitehall Lecture Series presents The Sherman Act, Interstate Commerce, and Baseball on Sunday, March 6th at 3:00 p.m. The Flagler Museum's 31st annual Whitehall Lecture Series presents How the 16th Amendment and the Federal Reserve Act Changed America on Sunday, February 28th at 3:00 p.m. The Flagler Museum Music Series presents the Bennewitz Quartet February 23, 2016, at 7:30 p.m. Tickets are $70. The Flagler Museum's 31st annual Whitehall Lecture Series presents Clarence Darrow: The Legal Practice of an Infamous Attorney and American Iconoclast on Sunday, February 21st at 3:00 p.m. The Flagler Museum's 31st annual Whitehall Lecture Series presents Plessy v. Ferguson: How the Legal Basis for "Separate but Equal" was Established on Sunday, February 14. The Flagler Museum invites couples to celebrate Valentine's at Whitehall on Saturday, February 13th, 11:30 a.m. - 2:30 p.m. and Sunday, February 14, 12:00 p.m. - 3:00 p.m. The Flagler Museum Music Series Presents the Neave Trio February 9th at 7:30 p.m. The Flagler Museum's Whitehall Lecture Series presents Executive Legacy: Presidential Influence on the U.S. Constitution February 7th at 3:00 p.m. The 2016 Flagler Museum Music Series presents the Vega Quartet January 26 at 7:30 p.m.
On January 19th at 6:00 p.m. The Flagler Museum will host a Special Lecture. The Flagler Museum's Holiday Evening Tours are offered on December 18th through the 23rd. The Flagler Museum will be hosting its annual Special Holiday Lecture and Christmas Tree Lighting on December 6, 2015. 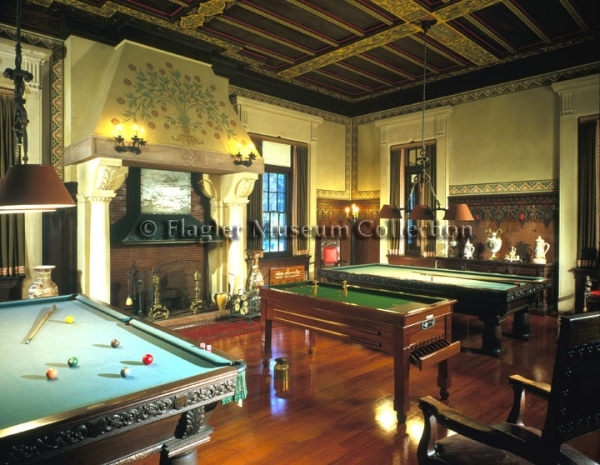 The Henry Morrison Flagler Museum has just completed a year-long conservation project to restore an important suite of French Louis XVstyle seating furniture that were owned by wealthy industrialist Henry Morrison Flagler and his wife Mary Lily, and made for the Music Room of Whitehall, their 1902 BeauxArts mansion in Palm Beach, Florida. The Flagler Museum's Whitehall Lecture Series Landmarks of American Law: Court Cases, Congressional acts and Executive Influence During the Gilded Age will be held each Sunday afternoon February 7th through March 6th. The Flagler Museum's Café des BeauxArts will be open from November 27 through March 26, 2016. Beauty's Legacy: Gilded Age Portraits in America, features fifty-three stunning portraits of prominent Gilded Age Americans by the leading painters from America and Europe. Flagler Museum's Gallery Talk for the Fall Exhibition, With a Wink and a Nod: Cartoonists of the Gilded Age will take place December 1, 2015, at 12:15 p.m. The Flagler Museum continues to provide the community with unique experiences and learning opportunities during the 2015 – 2016 Season. Please include the following events and dates on your calendars. The Flagler Museum hosted its Director's Annual Luncheon on March 31st for high-level Members, Grantors, Contributors, and Sponsors. The Flagler Museum's Café des Beaux-Arts will open specially for Mother's Day on Saturday, May 9th from 11:30 a.m. to 2:30 p.m. and on Sunday, May 10th from 12:00 p.m. to 3:00 p.m. The 10th Annual Bluegrass in The Pavilion concert will bring the best Bluegrass musicians to South Florida Artists for the 2015 performance are Balsam Range and The Grascals. Children are invited to hunt for more than 7,000 candy-filled eggs during the Flagler Museum's Easter Egg Hunt and Egg Roll on Saturday, April 4th, 2015. Described as "a miracle of unified thought..."(La Presse, Montreal) and "nothing short of a revelation"(Calgary Herald) the Calidore String Quartet has established itself an international reputation for its informed, polished and captivating performances. Each of these three world-class instrumentalists have had a long association as artist-faculty with the Aspen Music Festival and after twenty years of friendship and music-making, Aspen String Trio members David Perry, Victoria Chiang, and Michael Mermagen decided to create an ensemble, which has now performed across the globe in the world's most prestigious venues. The Flagler Museum continues to provide the community with unique experiences and learning opportunities during the 2014/2015 Season. Please include the following events and dates on your calendars. Children are invited to hunt for nearly 8,000 candy filled eggs during the Flagler Museum's Easter Egg Hunt and Egg Roll on Saturday, April 19, 2014. Gates open at 9:00 a.m. and events begin promptly at 10:00 a.m. Admission is $10 for children and $18 for adults. The festivities are sponsored by the Palm Beach Daily News. The 10th Annual Bluegrass in The Pavilion concert continues to bring the best Bluegrass musicians to South Florida. In 2014, Russell Moore & IIIrd Tyme Out and Doyle Lawson & Quicksilver will perform great Bluegrass music at this National Historic Landmark. Proceeds from the concert benefit South Arts' emergency planning for Gulf Coast cultural institutions. The Flagler Museum invites fourth through eighth-grade children to a special gallery tour with the Museum's Education Director on Saturday, February 15 at 10:00 a.m., followed by a hands-on learning activity. Children will be provided decorative materials to craft a silver cup, as seen in the Exhibition. Join exhibition curator Margaret K. Hofer for a tour of the Flagler Museum's Winter Exhibition, Stories in Sterling: Four Centuries of Silver in New York, at 12:15 p.m. on February 25th. Margaret K. Hofer is Curator of Decorative Arts at the New-York Historical Society and co-curator of this exhibition. In celebration of Valentine's Day the Flagler Museum's Café des Beaux-Arts will offer romantic Tea-for-Two packages on February 14, 15, and 16, 2014. The 29th Annual Whitehall Lecture Series welcomes best-selling authors and lecturers to discuss Crimes of the Century. There will be a book signing with the author after each lecture.